Maps of Thailand - Central, Eastern, Northern Thailand, Southern Thailand....! To view the maps please click on the region below. 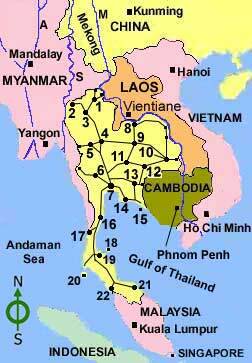 The map shows locations of Myanmar (Burma), Laos, China (Yunan province), Vietnam, Cambodia, Malaysia, Singapore, Andaman sea, Gulf of Thailand, and Sumatra island of Indonesia.